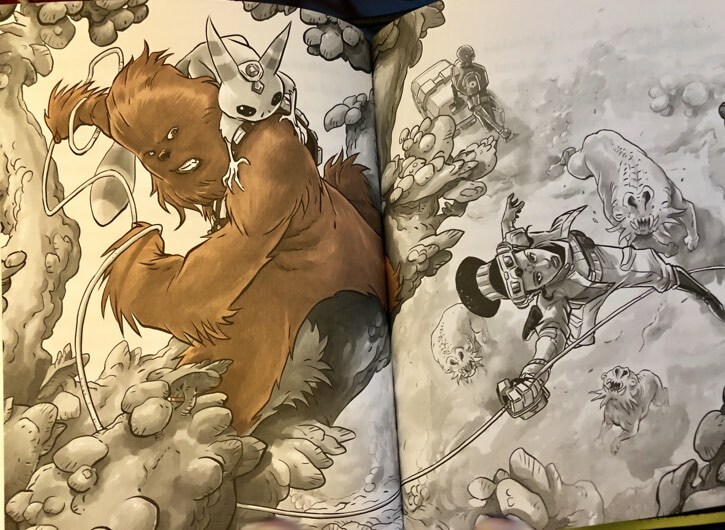 With all the attention on Solo, I was delighted when the review copy of The Mighty Chewbacca In the Forest of Fear by Tom Anglebeger showed up. I’m a huge fan of Tom’s Origami Yoda series and couldn’t wait to tear into this book about Chewie. Tom’s book is geared towards fans of the Origami series, but I think that Star Wars fans are going to enjoy it. From what I could tell, the book takes place between Solo and Rogue One, and includes a special character from Rogue One. With Tom’s unique storytelling, the character from Rogue One leaps off the pages and fits into the story perfectly. Tom captures the dialogue and the essence of the Rogue One character with perfect finesse and believability. I don’t like giving away too much of the plot, but Chewbacca is forced to join a young bounty hunter/librarian (HOW COOL IS THAT?) on a mission to a planet to recover a sacred book and save Han Solo’s life! There are also wonderful illustrations by Andie Tong! There’s a lot of action and drama in The Mighty Chewbacca In the Forest of Fear that fits in well with the Star Wars universe. Tom does a great job of creating a mythos that is deftly woven into what we know of the universe and the galactic war. And he offers some of the first known translations of Shyriiwook that I’ve run across. The Mighty Chewbacca and the Forest of Fear is a lot of fun. It’s a great addition to the Star Wars universe and fans of Solo are going to enjoy a deeper look at our very favorite wookie. As I mentioned, the book is written for early tweens, but Tom’s vitro-blade sharp sense of humor will please everyone. Are you going to pick up The Mighty Chewbacca In the Forest of Fear? Dollywood Souvenirs: Weird and Wonderful!